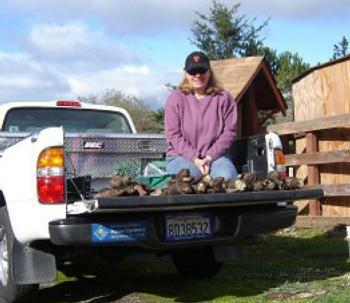 In 2008, Master Gardener Virginia Martin and others tested growing Andean root crops at the Elkus Research Garden. One of the crops chosen was Yacón (Polymnia sonchifolia). A distant relative of the sunflower, Yacón seems to thrive just about anywhere with consistent moisture and moderate sun and reasonable soil fertility. Rather than grow from seed, Yacón plants come from dividing the “crown, ”a ginger-like root structure where the edible tubers emanate. This is done, as with potatoes, with each new sprout emerging from an eye. The plants can reach 5-7 feet tall, are quite attractive, and will flower only with a growing season of six months or more. We planted three little plants at the end of March. In mid-December, we harvested one plant which gave us a yield of 22 pounds of edible Yacón. We found this plant easy to grow with minimal pest problems. Although we grew our plants in zone 17, they should work equally well in all of the climate zones in the Bay Area. It is believed that Yacón originated from the high Andean Region now known as eastern Bolivia and southern Peru. It is only recently, thanks to the efforts of a few intrepid plant people, that this unique cultivar is finding its way into the fields of North America. After a failed attempt at industrial scale cultivation and commercialization in Southern Europe in the 1930s, Yacón is now emerging as a commercial crop in South American, New Zealand, Japan and Korea. Here is a step-by-step description of how we grew Yacón. March 22, 2008: We purchased three plants from Nichols Garden Nursery in Oregon and planted them in native soil mixed with barn manure. No other fertilizer was used. Since these plants can grow tall, we built a trellis-type support behind them. They were planted at the end of our rectangular beds. May 13, 2008: The Yacón are growing very slowly. We believe this to be our fault since we repaired the automatic drip irrigation system but forgot to turn it on. We also discovered some fungus on the leaves of one plant. The distributor sent us a replacement plant. May 20, 2008: Transplanted the new Yacón plant. July 15, 2008: Yacón is growing nicely. 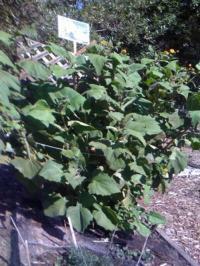 It is a beautiful plant with big hairy leaves and is being supported by the trellis with the help of some string. December 13, 2008: The Yacón has continued to grow through the summer and fall. 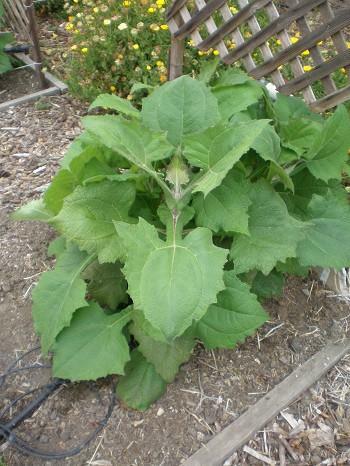 It has produced little yellow flowers and is growing very tall (over six feet). It is really a very attractive plant. 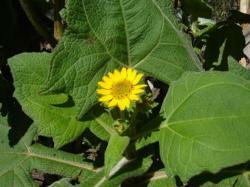 It has finished flowering and the leaves are turning slightly brown. It is time to harvest but it is raining right now. We’ll harvest after the rains. December 17, 2008: Generally, one would harvest the plants after the first hard frost. However, there is no frost at our demo garden! We harvested one plant only. First, we cut off the stalks. 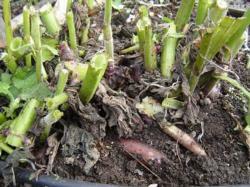 Then we dug gently around the plant with our hands (sort of like digging up potatoes) in order to no break the tubers. The tubers are very delicate. 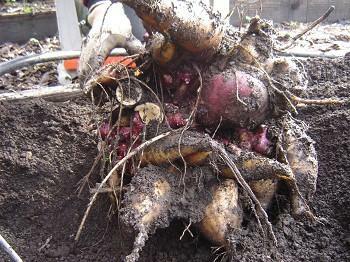 After some time, we could lift the entire root mass out of the soil. We were astonished at how huge it was. We found three types of tubers: one that looked like a sweet potato, was about 10 inches long (we think these are the older tubers); another that was round and reddish (we think these are the newer tubers) and the many round purple tubers which are the crowns for next year’s plants. These crown tubers weighed in at 11 lbs. Charlene shows off our harvest – all from one plant! We will store these in sand for replanting next year. As for the other two plants: on one, we cut the stalks down and covered it with barn straw to test whether we can harvest a few tubers through the winter. We left the stalks on the other plant, and covered the base with barn straw. We found the Yacón to be moist, sweet with a hint of strawberry or melon, and with a texture very much like jicama. The flavor is very good. After Yacón is harvested, it should be left out to increase the sweetness. We left ours on our kitchen counters for a few days. The skin can be either scrubbed off or pealed. Yacón remains low in calories. This is due to the fact that the sugar contains high levels of oligofructose (inulin), a form of sugar that is not metabolized readily by the human body. For this reason, Yacón shows much promise as a food for diabetics and as a base for a low-calorie sweetener. Yacón is high in fiber, low in fat, and rich in inulin. Some consider it to be the super food of the future. Next year, we will plant the crown divisions in growing medium in 4-6 inch pots, two to three months before the last frost date for the region. The resulting plants will be hardened off and transplanted only after the soil warms and all danger of frost has passed. We will allow at least a 3' spacing to give each plant room to grow. Others growing yacón have reported having problems with gophers; one gardener reported seeing the entire plant being dragged into the ground. We didn't experience this problem; our demo garden beds are gopher-proof. Slice yacón and add it to an ordinary green salad with ordinary dressing. This was a great hit. Mix all ingredients together. Delicious! Thai Chicken (serves 2) ? 1/4 lb chicken breast, cut up in pieces ? Cook all ingredients, except chicken, for ½ hour; then add chicken and cook 15 minumtes longer. Serve with rice.